It has been awhile since I’ve read a graphic novel and am delighted to return to the format with a Green Lantern story. 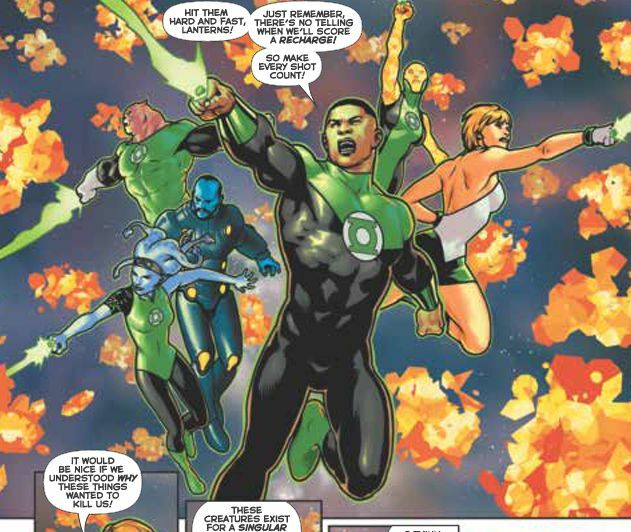 The book opens with Green Lantern John Stewart and a handful of other Lanterns waking up on a strange planet. Stranger still, their rings can’t identify where they are or where any of the other Lanterns might be. They appear to be in a completely different universe and there is no battery for any of them to recharge their rings. And if this weren’t bad enough, they are attacked by an alien race that somehow manages to draw power away from their rings. Stewart steps up as a leader of this band of leaders, which irks a few, but since no one else has any plan to see them to their own universe he sticks with it, and he reflects on what leadership means, both in his current time as well as in flashbacks to his time as a soldier. 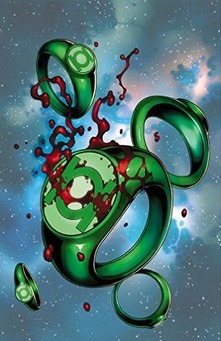 Two beings from the strange universe aid the Lanterns, though perhaps for very selfish reasons, and the Lanterns find themselves facing off against a volley of attacks, though do manage to find a way to keep their rings from completely shutting off. but the appearance of someone well-known to them (to Stewart, at least) complicates matters and adds to the questions about where they are and why they’re there, rather than answering them. There was something really great about this story – a ‘man vs nature’ sort of story in an off-kilter sort of way. 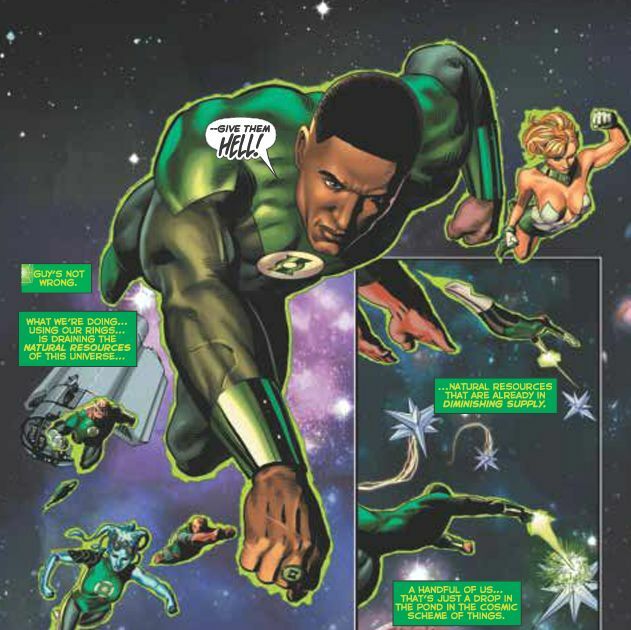 It was nice to see the Lanterns using more than their rings, but their wits, to get them out of jams, and to see them struggle with discovery and loss in a human way (though of course most of the Lanterns aren’t human). Author Cullen Bunn really builds the mystery nicely and understands the comic and graphic novel formats and how to deliver a story. I’m very definitely hooked on the story and curious to see where this goes next. It was also nice to see some of the more unusual Lanterns get a chance to shine here (again, more by wit than by ring). There is definitely a bit of difference in the quality of the work. That on the left (or above, depending on the format you are reading this), is the much rarer form of art in the book. But with the powerful story, I’m definitely drawn in (pun not intended) and while the weaker art is disappointing, it won’t keep me from wanting to read more of this story. Looking for a good book? The graphic novel, Green Lantern Corps: Lost Army Vol. 1 has a strong, promising story that should be enjoyed by comics fans and Green Lantern fans.